Intense mining in Germany causes mine drainage with high potential to contaminate fresh water. We cooperated with leading experts including environmental coordinators, Germany’s biggest mining company (RAG), water quality specialists, and environmental chemists. While exploring solutions, we identified mine drainage as a rich source of valuable metals. Due to dwindling resources and increasing demand we engineered bacteria for ecofriendly recycling of these metals and scavenging into nanoparticles. A NASA associate pointed us towards ferritin, a metal binding protein. Collaborating with the RAG during our project, we discussed the impact of iron and copper on fresh water quality as well as requirements for a device capable of filtering mine drainage. In close contact with an expert on copper biochemistry, we developed a functional system for copper uptake – unprecedented in the iGEM community. Through continuous discussions with various stakeholders, we identified printing acquired metals as a promising application. Searching for a possible source of metal ions we contacted the Ruhrkohle AG (RAG) which is Germany's biggest coal mining corporation. 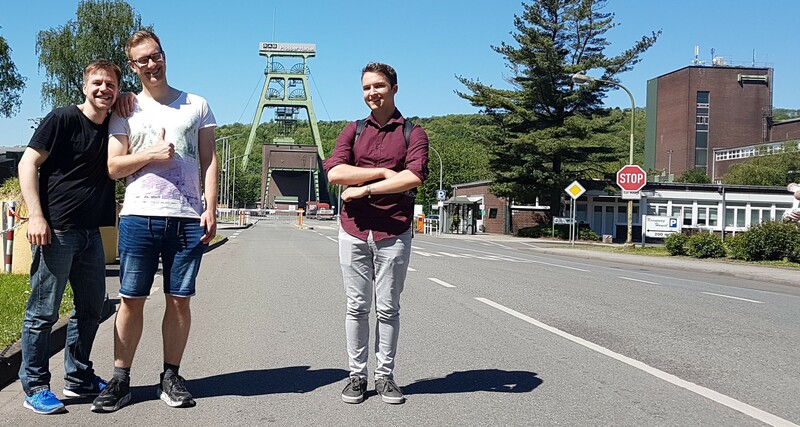 The RAG is responsible for many coal mines stretch over great areas underneath the state of Saarland and North Rhine Westphalia where our University is located. One of the major tasks of the RAG is to pump up mine drainage which is caused by ground water seeping through different layers of rock and flooding the coal mines. This water is getting contaminated with heavy metals and threatens to pollute water supplies if it is not pumped out before rising into the groundwater bearing layers. The water has a temperature of approximately 20°C and depending on its quality is either further processed by removing iron or gets dumped directly into rivers. To learn more about the mine drainage and how it affects the growth of E. coli we visited the mines Hanel and to take water samples of mine drainage sites which showed high concentrations of iron up to 41 mg/l and used those for our first growth experiments. Figure 1: Team members visit experts at the coal mine in Prosper-Haniel, NRW, Germany from left to right Christoph Geske, Levin Joe Klages and Johannes Ruhnau. Because information about the exact mining drainage composition is not easily accessible we contacted Dr. Michael Drobniewski who is the Director of Operation of the Mine Water Management Division at the RAG. He gave us valuable information about the water composition and invited us to a personal meeting. 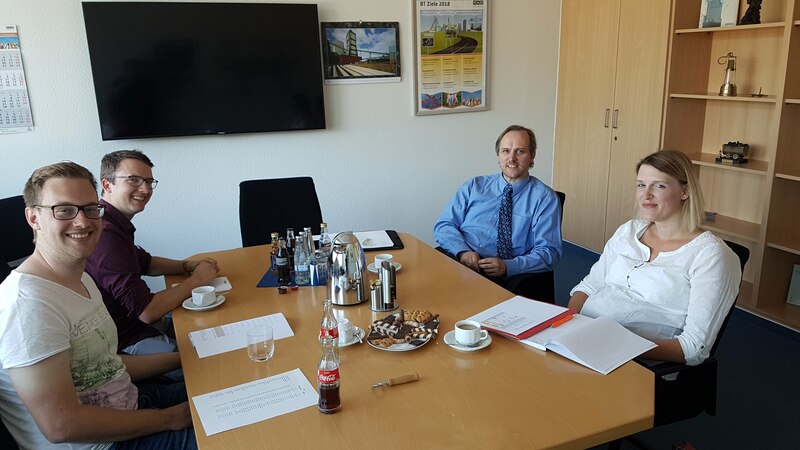 Figure 2: Meeting with Dr. Michael Drobniewski, director of operations of the ‘Mine Water Management Division’ in the ‘Technical and Logistics Services Division’ at the RAG AG. In our meeting we learned that the high levels of iron in the mine drainage of up to 41 mg/l is one of the issue the engineers at RAG have to deal with. Currently the RAG uses precipitation medium and special facilities to remove iron from the mine drainage. Equipped with this knowledge and the offer of the RAG to supply us with samples of mining drainage containing high amounts of iron and copper we decided to dive deeper into the science of iron and copper nanoparticle formation. Our goal of developing novel materials with the added benefit of cleaning contaminated water sources found with the RAG an important partner to bring us closer to our goal of exploring mining drainage as a source for valuable metals. 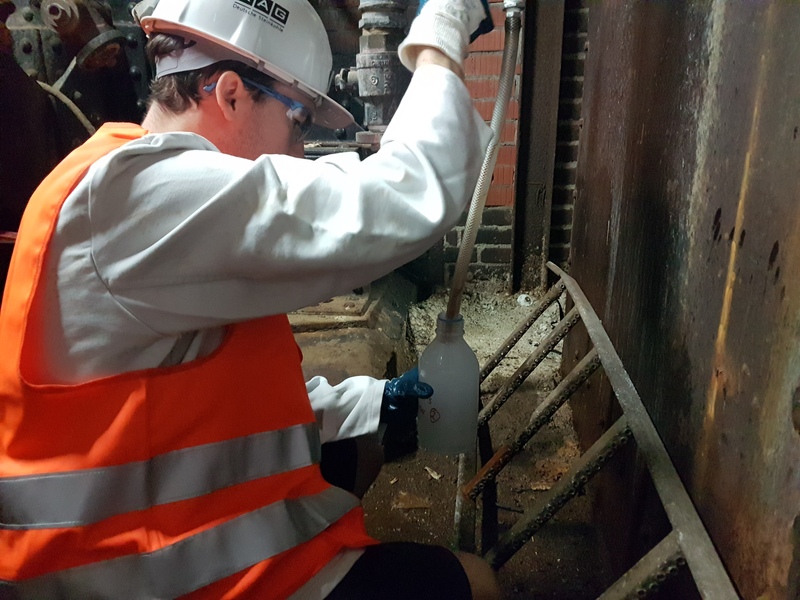 Through our continuous collaboration with the RAG we got the chance to join a pump maintenance team on their round trip and we were able to take multiple water samples from two sources with especially high amounts of iron of up to 41 mg/l as was determined by internal water quality tests. Figure 3: Johannes taking mine drainage samples at the mine Zollverein. At NASA, scientists also think about the possibility to utilize bacteria for the purpose of biological remediation of metals. One of those scientists is Benjamin Lehner who works at NASA among other things on the uptake of iron from moon rock which might be used to produce electronics when a continuous base is established on the moon. 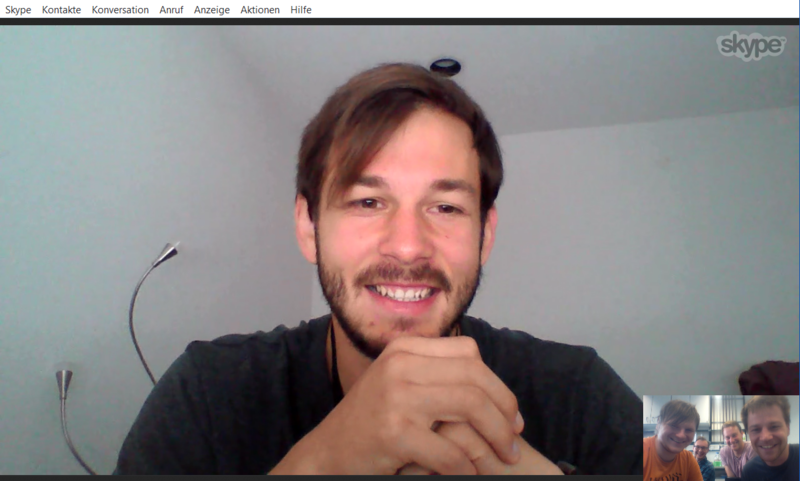 Figure 4: Skype call with Benjamin Lehner, PhD Exchange Candidate at the NASA Ames Research Center in California, Silicon Valley. We talked with Benjamin about our project idea, possible bottlenecks and how NASA and iGEM work together. Thanks to his great insights we learned that the uptake of iron ions in high amounts by bacteria is possible and that printing with iron in space is currently a field NASA is working on.  He explained to us, that iron can be used in the construction of conducting structures when used in an air free atmosphere for example on the moon. This changed our assumptions on which metals can be used for printing conducting structures and we decided to add iron to the list of metal ions we could use for our printing applications. His encouraging remarks about the possibility to import very high amounts of iron ions into cells gave us the confidence to further pursue our work in the direction of iron uptake with the help of modified ferritin. By also focusing on iron uptake we add another important metal to the list of materials which can be found in elevated levels in pit water all over Germany. Mr. Lehner also encouraged us to continue our work on copper uptake because to his knowledge 20% of the global copper mined and recycling is already done with the help of bacteria and it’s an essential metal required in many industrial applications. He also recommended us to get in contact with Jon Marles-Wright which is an expert in the field of ferritin and its possible applications. 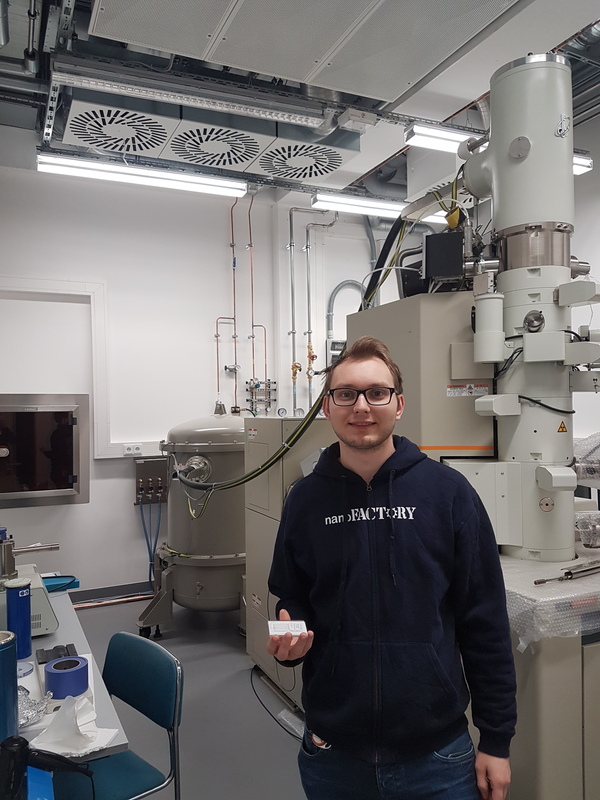 To gain valuable insight about physical characteristics of our nanoparticles we stood in close contact with the physics department here at our university. By granting us access to measurement equipment like an electron microscope and through a constant dialog with the department we were able to attain a new level of understanding about our nanoparticles. Beside the expertise and advice on how to deal with nanoparticles we made extensive use of multiple TEM microscopes which require an experienced operator who spends long hours helping us to load the probes inside the vacuum chamber and set up the TEM correctly. Figure 5: Matthias Otto visiting the 200kV TEM at the physics departement at the University Bielefeld. Ferritin is a capital field of research and it is hard to get a grasp of all the possibilities this amazing protein presents. 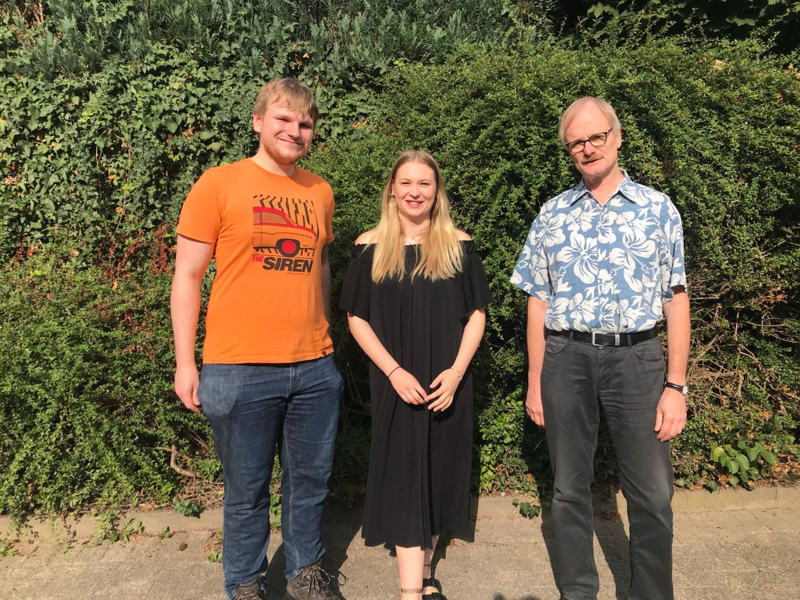 Jon Marles-Wright who is also affiliated with the Newcastle iGEM Team was a great help in this regard and described to us his prefered protocols for ferritin purification and gave us valuable advice on the structural remodeling of the ferritin cage. 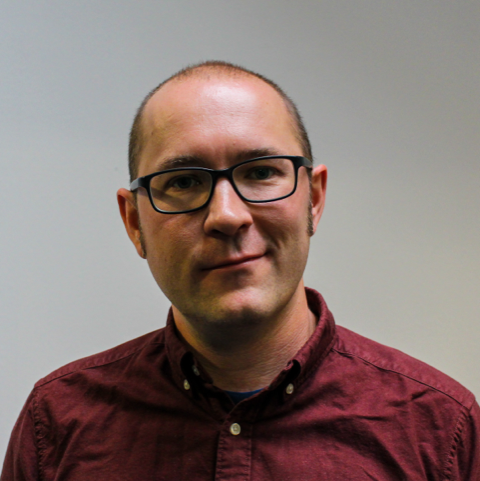 Figure 6: Dr. Jon Marles-Wright expert on ferritin and also affiliated with the iGEM team Newcastle. His detailed description on how to purify ferritin for example helped us to increasing our yield which was very helpful for our gold and silver nanoparticle experiments. 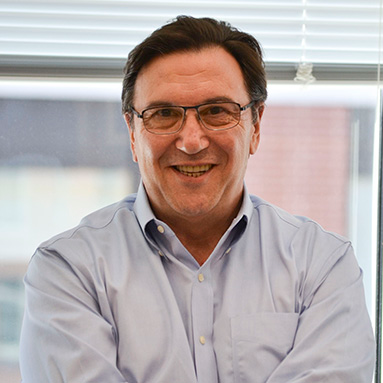 Prof. Dr. Jose M Argüello is a professor at the Worcester Polytechnic Institute (WPI). His main field of science is the homeostasis of micro nutrients as in prokaryotic systems. Figure 7: Prof. Dr. José Argüello expert on homeostasis of micro nutrients as in prokaryotic systems. We found out about him by doing research on HmtA (BBa_K2638000) and finding a bachelor thesis written by Yi Sun. This bachelor thesis was approved by Prof. Dr. Jose M. Argüello. We contacted him for advice on copper transport systems and he advised us during an E Mail exchange to use OprC (BBa_K2638200) from Pseudomonas aeruginosa if we want to import copper ions from the surrounding media. As shown on our copper accumulation. Moreover he sent us important literature and models that we could implement into our modeling. Walter Thomas is an expert on mine drainage working for the environmental department of the saarland. We talked at the telephone about the problems of mine drainage and the bad public attention about this topic. In his opinion either the coverage is not existent or it is too sensational. Moreover he supplied us with data sheets about metal ion concentrations in pits throughout the Saarland region here in Germany. Using the information provided by Mr. Thomas we learned that 160 mg/kg copper is the upper limit for surface water stated in the environmental quality standard (Umweltqualitätsnorm / UQN) and that multiple mines located in the Saarland exceed these limits for example in 2017 amounts of 652,50 mg/kg copper where measured in the mine drainage of the mine Reden. Dr. Rüdiger Gaydoul is the executive director of HBICON, a local institute for surveillance of the quality of natural resources as water quality and as consulting institution for companies. We asked him about the necessary properties of tap water and actually used processes to separate metal ions from drinking water. Furthermore as a contact person to the industry we talked as well about the target group of our system being middle-class businesses with less financial resources than big companies. We talked as well about our reactor design and he stated some ideas. His expertise about industrial and economic structures helped us to improve the way we designed our reactor toward being financially viable for middle-class business.